The Digital News Report: Australia 2018 finds that three quarters of Australian news consumers say they have experienced one or more types of fake news, and they are worried about it. Those who mainly use online news sources report encountering fake news more often, compared to print and TV. Those who experience fake news also have lower trust in news generally. The level of concern about fake news is higher than peoples’ experience of it. While only 25% of Australians say they have encountered politically or commercially fabricated news, 67% say they are worried about it. Similarly, 40% experienced ‘poor journalism’, but almost two thirds of survey respondents (63%) said they were worried about it. This disconnect between experience and concern reflects the heightened public debate around ‘fake news’ in politics and the news media. The report also finds that 81% of Australians think it is the responsibility of media companies and journalists to combat fake news, compared to 75% who think it should be tackled by technology companies such as Facebook and Google. Only 68% thought it was up to government to solve the problem. Cite the report as: Park, S., Fisher, C., Fuller, G. & Lee, J.Y. (2018). Digital news report: Australia 2018. Canberra: News and Media Research Centre. DOI:10.4225/50/5b21a3c6f196a. Digital News Report: Australia 2018 co-authors Sora Park, Caroline Fisher, Glen Fuller and Jee Young Lee wrote an article for The Conversation addressing Australians' reluctance to express their political views on social media. The piece was reposted by usnews.com. 'Trust in the news is up — but there's still only a 50-50 chance you'll trust me on that', ABC News Online. 'Australian media consumers more polarised than the global average', Guardian Australia. The report's findings were also covered by the Sydney Morning Herald. In addition to these press articles, the Digital News Report: Australia 2018's authors have given interviews discussing the report's key findings. ABC Adelaide Drive - Thursday 14th June with Caroline Fisher. ABC Melbourne Drive - Thursday 14th June with Caroline Fisher. Triple J's Hack - Thursday 14th June with Caroline Fisher. ABC 666 Mornings - Thursday 14th June with Caroline Fisher. What's the future of media for young people? - 'The roundtable', ABC Radio National, Monday 25th June with Sora Park. Digital trends and opportunity for government communication - Content Group Govcomms podcast, Tuesday 31st July with Caroline Fisher. Policy Forum Pod Extra: protecting the media - Tuesday 7th August, with Caroline Fisher. 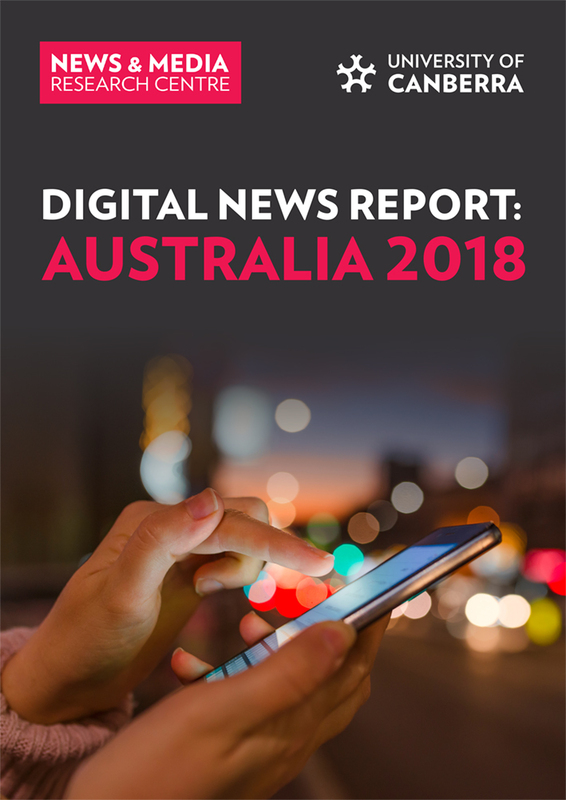 The Digital News Report: Australia 2018 is the fourth in a series of annual reports which tracks changes in news consumption in Australia over time, particularly within the digital space. The Report is published by the University of Canberra’s News and Media Research Centre (N&MRC). The online survey was conducted in Australia between late January and early February 2018. The final sample size was 2026 adults who access news once a month or more. The Australian survey forms part of a global study of 37 territories by the Reuters Institute for the Study of Journalism at the University of Oxford. To download the full 37 country report, visit www.digitalnewsreport.org.